PASADENA, Calif. — Scientists using images from NASA’s Mars Reconnaissance Orbiter have estimated that the planet is bombarded by more than 200 small asteroids or bits of comets per year forming craters at least 12.8 feet (3.9 meters) across. The orbiter’s High Resolution Imaging Science Experiment (HiRISE) camera took pictures of the fresh craters at sites where before-and-after images by other cameras bracketed when the impacts occurred. This combination provided a new way to make direct measurements of the impact rate on Mars. This will lead to better age estimates of recent features on Mars, some of which may have been the result of climate change. These asteroids, or comet fragments, typically are no more than 3 to 6 feet (1 to 2 meters) in diameter. Space rocks too small to reach the ground on Earth cause craters on Mars because the Red Planet has a much thinner atmosphere. 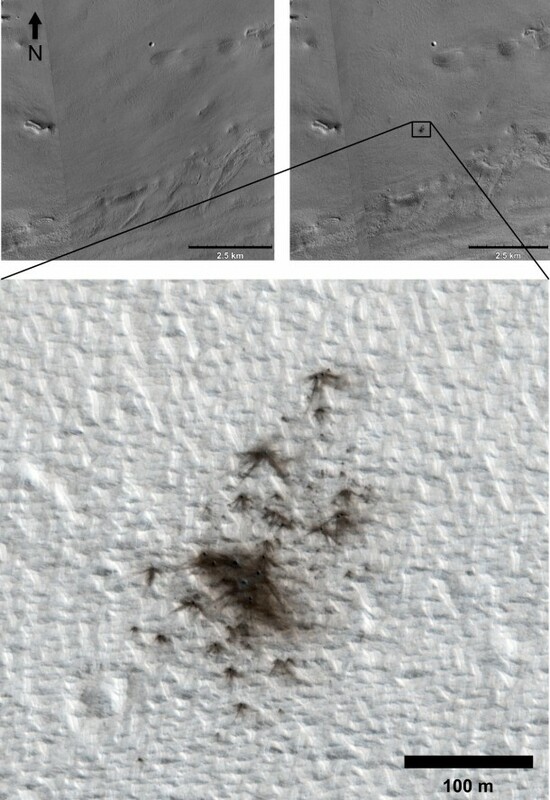 HiRISE targeted places where dark spots had appeared during the time between images taken by the spacecraft’s Context Camera (CTX) or cameras on other orbiters. The new estimate of cratering rate is based on a portion of the 248 new craters detected. It comes from a systematic check of a dusty fraction of the planet with CTX since late 2006. The impacts disturb the dust, creating noticeable blast zones. In this part of the research, 44 fresh impact sites were identified. “Mars now has the best-known current rate of cratering in the solar system,” said HiRISE Principal Investigator Alfred McEwen of the University of Arizona, a co-author on the paper. The Mars Reconnaissance Orbiter has been examining Mars with six instruments since 2006. “The longevity of this mission is providing wonderful opportunities for investigating changes on Mars,” said Mars Reconnaissance Orbiter Deputy Project Scientist Leslie Tamppari of NASA’s Jet Propulsion Laboratory, Pasadena, Calif. The University of Arizona Lunar and Planetary Laboratory operates the HiRISE camera, which was built by Ball Aerospace & Technologies Corp. of Boulder, Colo. Malin Space Science Systems of San Diego built and operates the Context Camera. JPL, a division of the California Institute of Technology in Pasadena, manages the Mars Reconnaissance Orbiter for NASA’s Science Mission Directorate in Washington. Lockheed Martin Space Systems, Denver, built the orbiter.